While some are more straightforward than others, invoices tend to lead to more questions than answers, masking a much larger story. This holds especially true for translation and language services. Where does the subtotal sitting at the bottom of the invoice come from? Some vendors leave very few hints, listing only vague categories that imply specific services. Others give a more in-depth picture, outlining the specific services and their corresponding cost formulas. However, itemized expense reporting isn’t the end goal here. The real concern is whether those translation services are relevant to your business goals — or as valuable as their price tags suggest. 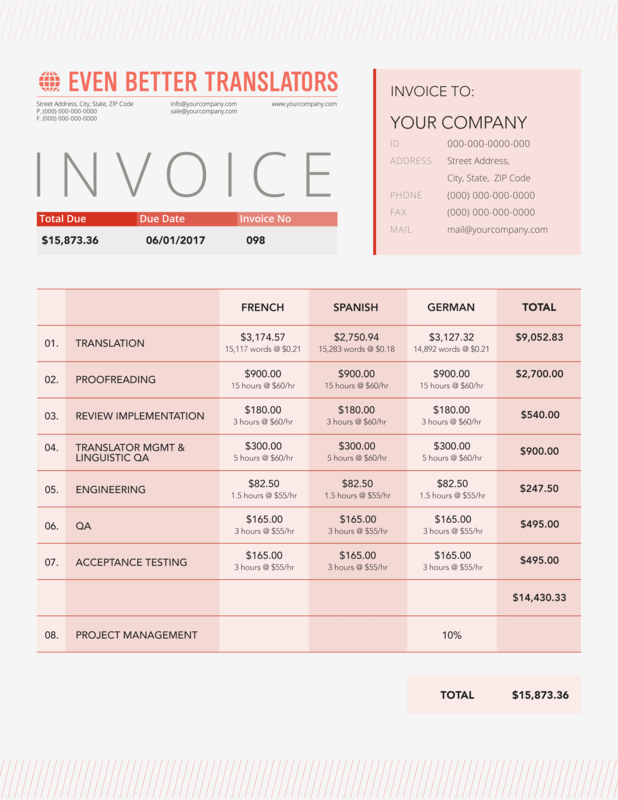 Before you start weighing the relevance and worth of your translation services, let’s first unpack the meaning behind some of the invoice items you’re most likely to see. Linguistic fees should be the easiest category to interpret. The initial act of translation is typically billed at a per-word rate that’s confirmed in the vendor’s upfront price quote. The linguistic quality assurance (QA) process which follows, however, contains more complexity. Core QA services include editing and proofreading, with the possible addition of in-country review and SME validation. These steps not only certify the accuracy of a translation, but its contextual relevance, brand consistency, and cultural sensitivity as well. And depending on the vendor’s preference, they may be billed on a per-word, hourly, or flat-fee basis. Engineering fees cover the slightly more obscure category of services that make content more usable for everyone involved. Engineers initially work with clients (and often their developers) to determine the best way to preserve the integrity of source files when transforming them into a translator-friendly format. Such conversations are relatively simple when discussing PDFs and Word documents, but handling web content, multimedia files, and programmer scripts requires much more technical sophistication. In addition to safely managing the content export process, localization engineers also play a pivotal role in reintegrating completed translations into source systems. The volume and rigor of this work will vary wildly depending on the client’s technical requirements, but the associated services are typically billed on a flat fee or hourly basis. Project management (PM) fees may be the most difficult category to grasp. While there’s no doubt the associated services are the glue that holds a strategy together, they’re often difficult to quantify with any precision. 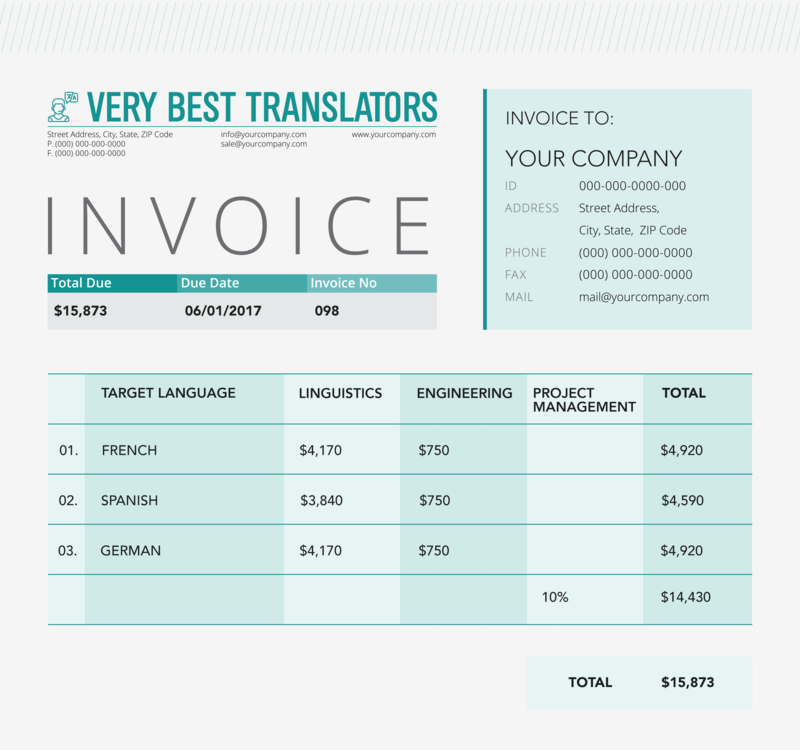 As a result, many translation vendors simply bill PM as a set percentage of the total invoice value. Translation project managers are primarily responsible for building systems and designing processes that cater to their client’s goals. At a minimum, this means setting priorities, creating workflows, and assigning linguists. But more often than not, the majority of their time is spent actively setting other teammates up for success. That may include briefing translators on content requirements, resolving disagreements between reviewers, or alerting project stakeholders to impending deadline risks. Then, as translations approach the finish line, project managers coordinate acceptability testing and orchestrate final delivery. Now that we know more about the services outlined or implied in the typical translation invoice, it’s time to start thinking about which ones you can bend to better serve your business. All too often, companies accept the standard process suggested by their vendor without a second thought. But what are the odds of any one-size-fits-all workflow perfectly suiting all your translation needs? Some types of source content will inherently hold less value and require less attention than the rest — and that’s the first place to consider cuts. Instead of assigning premium talent and extensive review protocols to every string of text, ask your vendor about more economical options they could apply to low-priority content. In addition to trimming wasteful linguistic measures, you may also be able to eliminate or expedite separate workflow steps with smarter technology. Modern translation management platforms can now automate many of the content collection, preparation, and distribution tasks formerly handled by project managers and engineers. And this software-based approach also empowers teams to track their own progress in real time. Finally, for those costs you can’t eliminate or moderate, you may still be able to negotiate. Will the vendor waive their minimum charges if you commit to a long-term strategy? Can you convert a service category to a more favorable pricing model? Any chance they offer volume-based discounts? If you never ask a question, you’ll never know the answer. Curious about how to control translation costs? See why companies like Hootsuite, WeWork, and Wish choose our Language Services.